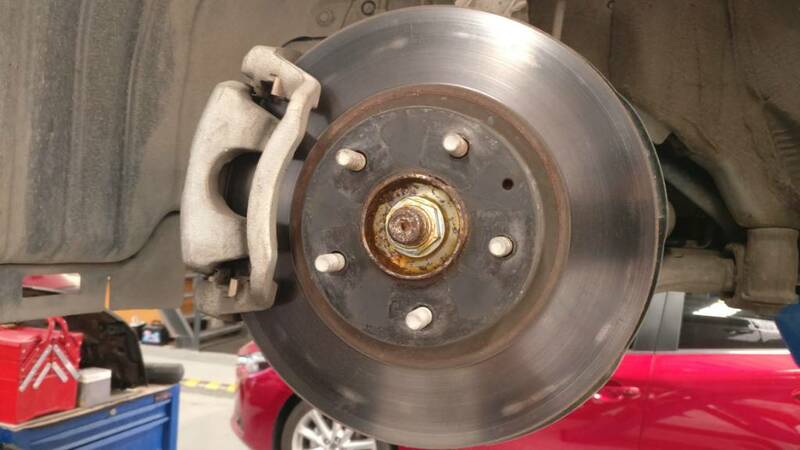 Hi guys i wanna replace the brakes on my 2015 Mazda 6 with OEM Mazda brake rotors and pads. I noticed that in general some OEM Mazda Parts No. Have A or B at the of the end of the part number. Does this mean the part has been revised? I Replaced my front Brake rotors with Advance Auto parts premium rotors and wagner thermoquiet braks and it wrapped in 2 months. So i was thinking of going too OEM, But they only lasted for like 30,000 miles. I noticed online that the brakes rotor and pads have A at the end of the part number, so those that mean they been revised? Any brake rotors or pads you recommend? I need something really good that will last a very long time, cost is no problem. Take the rotors in and have them machined. Should be $10-$15 each. Clean rotors with a solvent (I use acetone) and put it back together (even with the old pads if there is still life) The rough surface of the rotors will re-bed the pads fine. I am using StopTech (Centric) Street and their slotted rotors with excellent results. I have a set of those (rotors are slotted and drilled with sport pads) on a Datsun 240Z that has had occasional HARD use for over 10 years now (2300lb car however). "The break-in procedure is critical to brake performance. The reason for a proper break-in is to establish an even layer of friction material deposited on the rotors from the brake pads. It is very important that this initial layer of friction material is evenly distributed"
Then do 5 mod*erate stops from 35 mph to 5 mph in rapid succession without letting the brakes cool. You should expect to smell some resin as the brakes get hot. Hey I decided to buy the centric premimn and centric posting quiet brake pads from Rock Auto. Lots of good reviews from what am seeing. Yep -- but the bedding procedure is CRITICAL. I do it on all my vehicles when new and whenever I change the brakes and have yet to run into judder problems. I have to pick my time though, as a place where I can get them good and hot and then NOT HAVE TO STOP while they cool is not easy. I do three to five cycles of 60-10 (NOT to a stop!) -- until I can smell them slightly -- and then drive until they're completely cool, which takes a good solid 10-15 minutes. Having a nice freeway on-ramp in the area of where you will finish the cycle with NO LIGHT (that could force you to stop) is a good idea. I don't think I ever understood how important this was till I started really being active on this thread. Thanks for the thorough education @tickerguy and @DrFeelGood . That is at 30,000 km and I don't know if it's because I didn't do the proper bedding procedure. I have raced this car four times and I was told to use tire choke instead of the handbrake. However, no one told me about it the first time I did it. So I suspect that it might be one of the cause. Or it could be because I have neglected cleaning it when I forded a flooded area. My question now, is it advisable to just replace the pads or I should have the rotors machined once I replace the pads?